Tuesday night, Trump held a campaign style-rally in Phoenix, Arizona. The rally was interesting, confusing, and telling, to say the least. The supporter with prime visibility was holding a 'Blacks for Trump' sign. 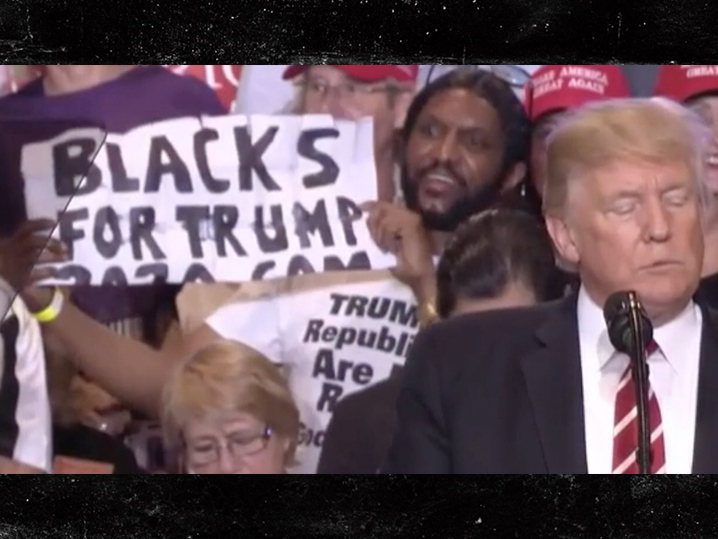 The supporter, who was probably strategically placed in such a visible spot, has become very well known for making appearances at various Trump rallies. This appearance set the stage for the craziness-that-is-now-becoming-commonplace that occurs at Trump's rallies. Trump took to his classic ways of bashing the media, and even attempted to taunt media backlash to his statement after Charlottesville. Trump re-read his Charlottesville remarks and stated, "I condemned in the strongest possible terms racism and violence...I think you can't do much better!" However, when Trump re-read his Charlottesville remarks, he omitted a key sentence, and the part that garnered the most media backlash: the quote that mentioned blame was on "many sides." Trump continued to taunt the media for calling him a racist, calling mainstream media "dishonest people". His rant about mainstream media went on for several minutes. Once again, Trump reaffirmed his rather uncanny obsession and critiques for mainstream media. "THEY want to take away OUR history & heritage," Trump tells the crowd at his #PhoenixRally. Trump also hinted to pardoning former Sheriff Joe Arpaio, who was found guilty of criminal content for decades of civil liberty violations and racial profiling. When speaking about Arpaio, Trump boasted, "He's going to be just fine." Moments of domestic crisis often define the legacy of a President. Donald Trump's presidency has already been met with historic backlash, but having an entire speech making himself the victim of media backlash. Doing this, rather than focusing on the height of racial tensions and divisions within the country, and without a single mention of the ten U.S. service members lost at sea is extremely concerning. James Clapper, former director of U.S. Intelligence, went as far as to say he questions Donald Trump's fitness for office. This story is developing and we will continue to update it.